Do you know the difference between salsify and scorzonera? Actually, I wasn’t even familiar with scorzonera until I read Roots: The Definitive Compendium with more than 225 Recipes by Diane Morgan, but I love learning new things about food. I learned scorzonera, also called black salsify, is very closely botanically related to salsify, and both have long, slender roots with similar flavors while scorzonera is milder. Twenty-eight types of roots are covered in the book with information about where they were originally grown, how they’re eaten, and their nutritional profile. And, following this information for each root, there are recipes. As I started reading the book, I was immediately fascinated by the Red Velvet Cupcakes with Orange Buttercream which are made with pureed beets and no food coloring. I made them in a rush and barely got just a quick photo to post on Instagram before taking them to a party where they disappeared in record time. Then while reading about galangal, I learned that “kha” in Tom Kha Gai is galangal in Thai. I never knew that, and I can’t wait to make this version of the soup. There are pretty dishes to make with cross-sectional cuts of lotus root, and a Three-Layer Parsnip Cake with Cream Cheese Frosting which would be a lot like a carrot cake. There’s also a Composed Jicama, Avocado, and Grapefruit Salad with Cilantro Drizzle that would be perfect for in-season avocados and grapefruit right now. And, of course, there are several dishes for that most popular of all roots, the potato. I can tell this book and I will be spending a lot of time together. In the Ginger chapter, you can learn to make your own Sushi-Style Pickled Ginger, a Brown Sugar-Ginger Ice Cream, and Candied Young Ginger. But first, I had to try the Homemade Ginger Ale. To start, you need to peel and grate enough ginger fill one-half cup. The grated ginger is then combined with brown sugar and water in a saucepan, and the mixture is brought to a boil and then simmered to dissolve the sugar. It’s then removed from the heat and allowed to steep and cool for about half an hour. Once cool, the syrup is strained through a sieve and chilled in the refrigerator. 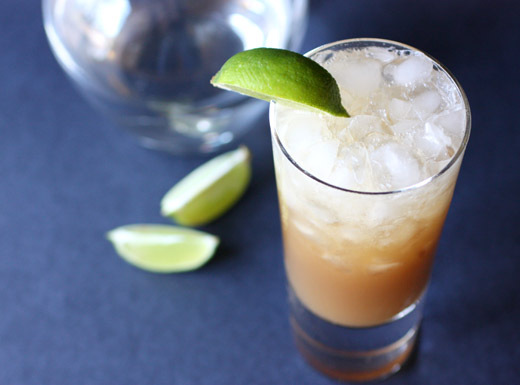 To complete the ginger ale, the syrup is mixed with club soda, lime juice, and lemon juice. Homemade soda is the best since you can control the level of sweetness. This ginger ale has good, spicy flavor with nice brightness from the lemon and lime. Naturally, I added rum to mine, but you knew I’d say that, didn’t you? Now, I want to go try a few things from the Sweet Potato chapter and then start asking around to find out if anyone is growing burdock root locally. Who knew it could be so simple to make ginger ale at home? Here’s an all-natural version, blissfully free of high-fructose corn syrup and preservatives. When I compared this homemade ginger ale to a national brand, it proved unrivaled in spicy, aromatic ginger flavor. Although the ginger syrup recipe makes enough for just four servings, it is easily doubled. Store the remainder in the refrigerator to use whenever you crave a tall, sparkling glass of refreshing ginger ale. 2. Fill four 16-oz/480-ml glasses two-thirds full of ice. Pour ¼ cup/60 ml of the syrup, 1 cup/240 ml of the club soda, 1 tbsp of the lime juice, and 1 tsp of the lemon juice into each glass and stir to combine. Garnish each glass with a lime wedge and serve immediately. A delightful beverage! Those flavors are just wonderful. This is perfect...especially for a pregnant person! I have been relying on ginger since I first found out about my pregnancy. Thank you so much for sharing. I hope you have a wonderful weekend! The ginger ale looks marvelous. I haven't been able to find a good bottled version, I guess homemade is the way to go. How nice! I don't drink soda, but a homemade one is something different and I am willing to try! My husband adores ginger ale! Plotting and planning for Valentine's Day is sure to include this treat! It would be good with a dash of gin too! That is a lot of effort to get so much ginger, but the end result looks to be well worth it. Wow! This is absolutely new to me. Sounds wonderful for sure. what a great idea. i have no doubt that i would find purchased ginger ale a severe disappointment after trying this! i've never thought to make homemade ginger ale - i bet it has such an intense and delicious flavor! love it! How cool to make your own Ginger Ale! I have a recipe kicking around somewhere - I should dig it out and compare to yours. And then actually make it! Love the idea, and you've definitely inspired me. Thanks! Yuuum!!! 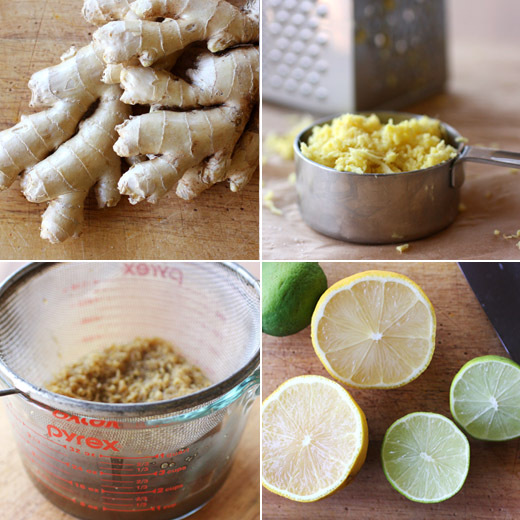 Have you ever tried to make ginger beer? I am going to have a go soon.. possibly with a cheeky alcoholic version! Lorraine: The cupcakes were very red! I loved the color and the flavor. This is a great idea, I've never thought of making it myself. funny you mention beet cupcakes, I had clipped a recipe from a Donna Hay magazine with the beets cupcakes, and did not get around to making them . this cookbook does sound interesting would have never thought of writing a cookbook only on roots. sounds so inventive and clever. while you are at it, can you check if soapwort is mentioned. it is used a lot here to make cream and to clean carpets! Joumana: I just checked, and there's no mention of soapwort in the book. It sounds very versatile! I love jicama, avocado and grapefruit salad! And I've read about using beets in red velvet cake recipes, but have never tried it. Pleased to hear they were successful, Lisa. Super idea to write a book on roots...so much we don't know! I love fresh ginger. It is so versatile, with it's flavor improving both sweet and savory dishes. And it's so good for you. Yes, who would have thought making homemade ginger ale will be THAT easy!. 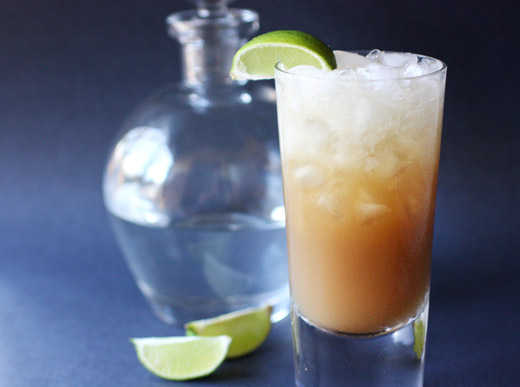 I am so making this, even if it´s only to have the ginger syrup to use as base for this drink and other baking confections. I am adding this book to my list.